Counting calories is one of the basic methods to a weight loss plan. With some vital information about how this approach to dieting works, an effortless and easy loss of extra weight is sure to follow. The equation for weight management is an uncomplicated one and straightforward: calories in equals calories out. For weight loss, the equation is defined as calories in less than calories out. Hence, the amount of food eaten (and the calories contained in that amount of food) is either the same or less than the calories your body needs for involuntary energy expenditure and voluntary physical energy needs. Know your calorie requirement by finding your basal metabolic rate specific for you. Calculate the amount of calories expended through your preferred physical activity. Reach a 3500 calorie deficit and say good-bye to a pound of weight. It is the accumulation of carbohydrate, protein, and fat, the three macronutrients, which comprise total calorie intake. In contrast, vitamins and minerals, known as the micronutrients, do not contain calories and do not add to calorie content. So, if 50 grams of carbohydrate, 9 grams of protein, and 10 grams of fat make up your meal, your total calorie amount would be 326 calories. Many foods contain a combination of the macronutrients, which generates a not-so-clear picture of calorie counts. For this reason, label reading, measuring and calorie counters are life-saving tools for keeping on track. Finding nutrition information is easy due to the nutrition facts label on most packaged foods purchased at the supermarket. Be sure to first check serving size and total number of servings contained in the package before proceeding. Once this information is known, you can easily tally up your calories by simply locating the total calories per serving at the top of the label. Carbohydrate, protein, and fat calories are also specified below the total calorie amount. It's very difficult to know what a serving size looks like. An average meal served at a restaurant is two times the amount an adult male should consume in one sitting, and three times what an adult woman should. Serving size - One of the problems that many dieters run into is not checking the serving size. A good example is whole grain cereals. They make a great, healthy breakfast. However, it's easy to consume two or more servings at one sitting if you aren't aware of the serving size. Usually, three-fourths to one cup is a serving. Measuring cups - When you are first beginning to diet, it's a very good idea to pick up a set of measuring cups to use when measuring your servings. It's often quite a shock to people to realize how much more than one serving that cereal bowl will hold. Once you've mastered reading labels and feel like you have a handle on serving sizes, it's important to begin writing down your foods. This will help you keep track of your calories throughout the day. Many studies have shown that dieters who keep a log of their meals and snacks lose more weight than those who don't. Handwritten journal - A very handy way to keep track of your food is to keep your journal with you at all times. When you are measuring your oatmeal in the morning, take the time to write it down immediately. Note the amount of calories per serving and the number of servings you plan to eat. Write the total number of calories per meal in a column to the far right, so you can easily add up your calories as you go through the day. Online programs - Everything has gone technological, even dieting. 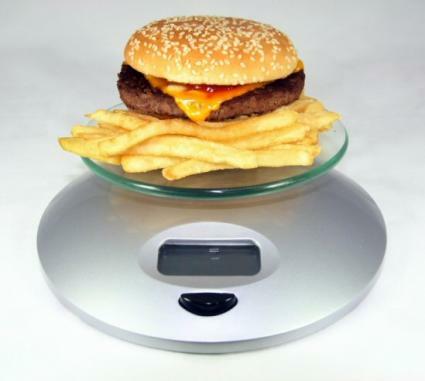 This is a tremendous benefit to the calorie counter, because many of today's online programs, such as Sparkpeople.com and Fitday.com offer the number of calories in chain restaurant meals and in fast food establishments. Using an online calorie counter can be a supplement to a handwritten journal, or can replace it all together. It's important though that you are able to remember what you ate long enough to log it in your online journal. If this is a problem, it may be necessary to keep both types of food journals. Indeed, consistent and persistent calorie intake awareness is one of the most successful methods toward a healthy body weight. Following a low fat diet plan plays a significant role in mastering this technique since fat contains nearly double the amount of calories per gram than carbohydrates and protein. Together with an exercise program that fits your lifestyle and fitness level, counting calories is healthful, safe, and effective. If you consider the overall picture, counting calories does not necessarily restrict you from eating any specific foods. In reality, there are no forbidden foods, but rather a focus on mindful eating related to balance and portion. Along with the idea of not feeling deprived of your favorite foods and treats, the outcome of this type of eating plan is enjoying what you eat while you lose or maintain your weight.